FAQs | The Old World Olive Co.
What is the UP (Ultra Premium) Extra Virgin Olive Oil? Old World Olive Co. is a proud member of the UP Extra Virgin Olive Oil Program. How does lowly vinegar come to reap such praise? As far back as 900 years ago, vintners in the Modena, Italy region were making balsamic vinegar which was taken as a tonic and bestowed as a mark of favor to those of importance. Although it is considered wine vinegar, it is not wine vinegar at all. It is not made from wine, but from grape pressings that have never been permitted to ferment into wine. Sweet white Trebbiano grape pressings are boiled down to dark syrup and then aged under rigid restrictions. The syrup is placed into oaken kegs, along with a vinegar “mother,” and begins the aging process. Over the years it graduates to smaller and smaller kegs made of chestnut, cherrywood, ash, mulberry, and juniper until it is ready for sale. All of these woods progressively add character to the vinegar. As it ages, moisture evaporates out, further thickening the vinegar and concentrating the flavor. Some balsamic vinegar has been aged for over 100 years. It is this aging process that makes true balsamic vinegar from Modena in Northern Italy so expensive. Luckily, a little balsamic vinegar goes a long way. You don’t have to travel to Italy to get great balsamic flavor. Stop in and give our Traditional Balsamic Vinegar a taste! 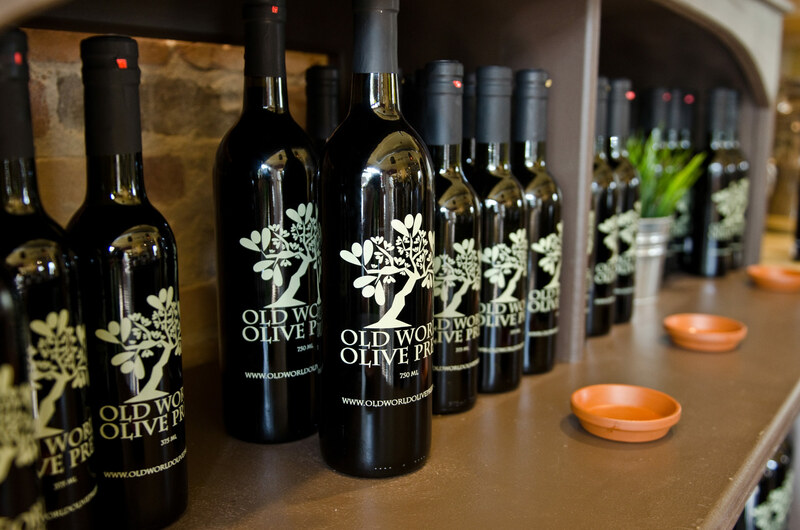 We are sure you will feel like you have slipped into your own little piece of Italy right here at Old World Olive Press. What is the difference between Old World Olive Press Extra Virgin Olive Oil and other store bought oils? DON’T BE FOOLED! There are several key differences between the olive olive you purchase at Old World Olive Press and other impersonators or our kind. Olives have a natural growing season just like other fruits and vegetables. To offer only the freshest available product, we carefully watch the seasons from both Northern and Southern Hemipsheres and select only the finest produce. Our goal is to provide you with only the best. When you sample the oils, you will notice a distinct freshness rarely found in other retailers, especially those purchased from a grocery store shelf. We are fortunate to have at our fingertips a certificate of analysis on all the regional olive oils we offer. This is important because it gives us valuable information like the date of crush, the polyphenol levels, and other crucial chemistry. If the above information isn’t convincing enough, simply stop in one of our three locations. One of our highly trained staff will be able to educate you on the chemistry of the olive oils we offer, or simply help you select one that suits your palate! Should I store olive oil in the refrigerator? It is best to store olive oil in a cool, dark place such as a pantry. Storing olive oil in the refrigerator can cause condensation to form in the bottle. Condensation/water in the olive oil will turn the olive oil rancid. Olive oil can last 12 months or more if stored properly. After the first year, the Vitamin E content will begin to naturally decrease. Vinegar will last 3-5 years. The shelf life of your product is largely determined by how it’s stored. The bottles have a great design, so why not store them right on your counter! Absolutely! In fact, why not try our Natural Butter Extra Virgin Olive Oil? Any recipe that calls for buttercan be substituted with olive oil. Simply follow the conversion chart below for the correct conversions. Use olive oil on vegetables, meats, salads, or anything that calls for butter! Not only will the flavor be better, but you are adding all the healthy benefits of olive oil to your diet. Olive oil can be readily substituted in most main course dishes where margarine or butter is used for frying or sautéing. The conversion chart above is appropriate for most cake and pastry recipes where quantities are critical. Keep in mind, however, that it is not always a good idea to use liquid shortening (olive oil/vegetable oil) instead of solid shortening (butter/margarine). For instance, since cake frosting must stay solid at room temperature, butter and powdered sugar work nicely, but olive oil and powdered sugar don’t. You should also consider the taste factor. A mild tasting late harvest olive oil could be used in most cake and pastry recipes because cooking will get rid of the aromatic olive oil flavors. Uncooked confections would taste more than a bit unusual if made with olive oil. Is Olive Oil Healthy For Me? Olive Oil is incredibly healthy for you! In fact, the health benefits of olive oil are so vast, we couldn’t begin to fit all the benefits here! However, here are just a few benefits of adding olive oil to your diet: Protection against Chronic Degenerative Disease, Protection against Heart Disease, Lower Blood Pressure, Prevention against blood clots, helps to reduce the risk of Breast Cancer, Better Blood Sugar Control, helps prevent Belly Fat and Improves Insulin Sensitivity, Acts as a Natural Anti-Inflammatory, Helps prevent Bone Loss, Supports Gastrointestinal Health, and has been found effective against Helicobacter pylori. Extra virgin olive oil is one of the best food oils available today. Simply adding olive oil to an unhealthy diet already soaked in saturated fats or vegetable oils will not lead to any of the benefits listed above and may actually cause more harm than good. When pure, extra virgin olive oil is used as a primary source of fat in a whole foods, healthy eating plan, the potential goodness of the oil prevails. Do you refill empty bottles? compromise the quality of the product.